Medical professionals understand the huge role the outside world plays in the lives of our children. Kids are like sponges. To raise them so that they can form healthy relationships at home, school and with their friends, we need to understand how to parent our children so that they connect with the world around them. What really is the world around them? We’re talking about physical surroundings, just as much as we are about community resources and the friends (and yes, boyfriends and girlfriends) they associate with. As little Spongebobs, they learn by absorbing. Kids need wide, open spaces to do the things kids like to do. While we have to watch our children, making sure they don’t do anything too naughty or walk off with the wrong person, we need to make time to get them outside. And when they’re inside, making sure their homes and schools are clean and nurturing will give the little ones the best chance to be outstanding adults. Our community shapes us all as individuals. If we have great libraries, parks and recreation centres to access, then we can be confident our teenagers aren’t hanging around in vacant lots or places where there is zero supervision. Kids are curious, so let’s give them something healthy to get curious about. All children want to fit in. If we take the time to show interest in our kids’ friendship groups, then we show them how important they really are. Social networking sites like Facebook might seem harmless, but make sure they are using them wisely – and are getting enough real-time interaction to practise face-to-face skills. If our kids start smoking, then we must look at their friendship groups and start asking why, and with whom, they are learning these behaviours. Pick your child’s school wisely, because that’s where they’ll spend most of their time. If you feel the area or school isn’t up to scratch, then don’t be afraid to make a change for your child’s sake. We cannot stress enough the importance of housing on a child’s social development. All children need to feel safe, secure and clean. Kids are incredible little humans and they will blend in with the environment around them. So if their environment is filled with positivity and security, that’s the direction they will head. In fact, hundreds of studies have been undertaken that prove, beyond a doubt, that children trapped in negative circumstances will not only be unhappy, but will head towards criminal behaviour. As parents, we can’t always be there as our child grows up. So the best we can do is ensure all the community resources, such as teachers or any authorities, are up to a standard that fits our children’s needs. We are also role models for our children. Positive social skills of our own, like talking out problems rather than resorting to any violent or negative behaviours, will imprint on young minds. Even just being there for children to talk to, with an open mind, creates the kind of relationships that form strong bonds within families. Children take this behaviour with them to the outside world. For children needing discipline, there are many ways to be firm by communicating, rather than shutting a child out of decision-making. 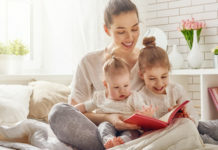 Communicating well will also help you develop good parenting skills – we are not given a set of rules when we have a child, so it’s normal to discover them along the way. The same goes with educating young minds. Children who attend good schools and get the best education from both teachers and parents are more likely to do better later in life. It’s been shown time and time again that children who are not properly educated, or ignored in this way by their guardians, will tend to float to risk-taking behaviour, not to mention dabbling in drugs and alcohol. Anything that helps children to be happy and healthy, gives them the best chance to grow up and contribute positively to the world around them. Giving them motivation, by supporting and cheering their hobbies and pursuits, will do them every good. A positive social environment also promotes improved physical health, such as reducing the risk of our kids falling pregnant or developing mental health problems like eating disorders. Getting them immunised and just taking an interest in their chosen sport is easy, and shows how much we love them and can make time for them. Get them involved in team sports, get them down to the rec centres. Do they love horses? Find a place to take them once a month. Are they great tennis players? Get them to a friendly, supportive coach. You never know, you might have the next Pat Rafter on your hands! But to get the best out of them and to make sure they don’t get too grumpy (especially the ‘teen’ variety), we have to be firm on routines. So bedtimes are early and always at the same time to avoid confusion. Even if we work 6 days a week, there is always every Sunday to make a plan, whether it be a walk in the park or just talking over Sunday lunch. Parents are great company, but we all know children love to play. So let them! Get them involved in hobbies with other kids their own age. This way they grow and develop into young adults who understand people around them. We’re not supposed to have all the answers, which is why parents, as well as children, need support. There are countless parent support groups and online sites that have all the help and advice you need when you are unsure which way to go. For more information, see Parenting and the Social Environment.